Well, it's that time of year where you look back on what you've accomplished and set forth new goals for the new year! 1. Get Organized: I'm very organized at work, and I'm looking to bring some of that organization back home with me. In order for me to accomplish this, I have created calendars for our dinner menu, my workout schedule and a cleaning schedule that I'd like to begin. 2. Commit to MS Treatment: I was diagnosed with MS last year. I began taking daily injections mid year and never fully committed myself to these injections. After many failed attempts, I'm making it my resolution for 2012 to actually commit to my treatment and inject daily. 3. Lose Weight: Of course, I have a "goal of losing" weight for the new year! I would like to reach 190 lbs. by 2013. That's a 50 pound loss. I'm up for the challenge! 4. Go to Church: I wonder if this is a common resolution? I haven't been to church very much this year, mostly because my husband and I don't like how some of the people at our church have been treating us. We either need to get serious about finding a new church, or just go back to our old church. Either way, I miss how good it felt to devote an hour each Sunday to prayer and worship. These resolutions aren't in any particular order and they aren't the only goals that I will be working on in 2012. Do you have similar goals that you'll be working on next year? As promised, here is what I made to bring with us to Christmas eve dinner! First you start with two blocks of cream cheese. Smooth the cream cheese evenly on your platter. Dollop 16 ounces of caramel sauce on top of the cream cheese. Spread until smooth. Add a bag of crushed heath to the spread. I cut about 10 medium apples in to slices and it was an equal amount for this spread! It is Christmas Eve and I am in a great mood! My holiday funk seemed to disappear this morning, and I am ready for what the holiday has to bring! My husband is working until either 2:30 p.m. or 5:00 p.m. today. We've got a party at my grandmother's house at 3:00 p.m. and another party at my mother-in-laws at 7:00 p.m. I made a yummy dessert which I will hopefully be sharing with you in my next blog. Along with my great mood, I also woke up to find that I am now weighing in at 241 lbs. I'm going to be realistic here and say that if I am able to lose any weight this holiday, I will be greatful. My goal of 235 lbs by next weekend isn't very realistic. Keeping in mind, however, that I am not going to stop trying to maintain/lose as much as I can before then. I am going to try to take pictures of everything that I eat today, that way I can hold myself more accountable for my actions this holiday! Hopefully I'll be able to post those pictures in my next blog, too! Well, I've got some more presents to wrap before tomorrow, so off I go. Enjoy your Christmas Eve, everyone! My co-worker got me a pair of these earrings that I was admiring just the other day! It was very thoughtful of her to get them for me, and it definitely made my day! I'm still working on losing the extra weight that I put on. This morning I weighed in at 242 lbs. Trying to lose 7 pounds in less than 2 weeks may be a little unrealistic, which is why I am not stressing over it. I'm just working toward losing as much as I can, while I can! 10 more days until the new year!! I have been craving the weirdest thing lately... vegetables!! I couldn't get enough green beans tonight! I love them! Before dinner, and after work, I went to the gym. The minute that I began working out on the elliptical, the stress from today melted away. I had my earbuds in, playing songs from my iPod; it was finally time for me, and I was loving it! The gym was so empty tonight, and I'm thinking that has something to do with Christmas being only four days away. I'm not letting the holidays stand in the way this year! I'm going to reach my goal for New Years Day! Yesterday I found myself saving calories for the end of the day. I tracked all of my meals and still had about 400 calories before I hit my minimum for the day. Does anyone else save calories like this? It seemed normal to me to do this, as I've been doing it for so long. After thinking about why I was saving the calories, I feel like I do it just in case I go on a binge spree. This seems to be contradictory though, because so often, I have a mini binge at the end of the day "because I have the calories". It's like I'm setting myself up with an excuse to binge. I think this is going to be a hard habit to break, but I'm going to try to start managing my calories better. I'm going to try to spread "the love" throughout the entire day. Today, I think that I did fairly well! I am ending the day within my nutritional ranges (per sparkpeople) and I feel great! Last night I did go to the gym, which was another reason to feel great today! My husband was able to go with me and we did a total of 20 minutes of cardio. Just enough to get that awesome endorphin high! Speaking of great things, our dinner tonight was very good! My husband made baked chicken and it was our first time using the fresh chicken thighs. I'm guilty of only buying frozen chicken, and I must say, I'm not going to be buying frozen for quite a while after having this meal! I made our salads tonight and we used romaine lettuce instead of iceberg. Another great change to our "norm"! I tossed the lettuce in a bit of grated parmesan, topped it with a drizzle of fat free Caesar dressing and it was delicious! Just to keep some balance in the world, I did have a hershey's chocolate bar for dessert, which took me to the higher end of my calorie range for the day. Worth every calorie, however, and good news is that I didn't go over my range! It's been a few days since I have blogged because I haven't been in the best of moods. I let the stress of the holidays and work get to me, and I ate... a lot. I have this habit of self sabotaging right before the holidays. I was half tempted to just call it a year and give up on my goal to reach 235 lbs by January 1st. After thinking about it more, I decided that I wouldn't give up just yet. I am keeping in mind the work that will need to be done in order to reach my goal now, and I am still up for the challenge. I have had a very stressful morning here at work, and I am counting on the gym tonight to help me work through it! I need to get a grip! I'm going to stop myself while I'm ahead. I actually started the morning off well; for breakfast I had a scrambled egg. For a snack, I had a clementine. Then, there were these chocolate covered pretzels. I had four of them. That's not a huge amount, but, it wasn't planned and I felt super impulsive when I ate them. I had a feeling that I wasn't going to stop there, either, but I managed to stop myself. Dinner is a little complicated tonight. After work, I am driving the 45 minutes home to pick up my husband. Then, we are driving 45 minutes back in to the city to attend my boss' Christmas Party. There will be a lot of snacks there, and it's going to be hard to resist. I feel the pressure of tonights food choices, weighing down on me already. I am going to do my best tonight, but if I am completely honest, I am starting to lose a little hope as to whether or not I am able to lose weight around the holidays. 1. Brown meat; drain. Add to slow cooker with remaining ingredients; stir. Cover with lid. 2. Cook on LOW 5 to 6 hours (or on HIGH 3 to 4 hours). 3. Stir just before serving. Serve topped with shredded cheddar cheese and/or sour cream if desired. ...these were chocolate cupcakes with silky peanut butter frosting. Oh my! I had my cupcake and it was amazing! I wish that I could say that I felt guilty about eating this cupcake, but I didn't. The thought in my mind was that some days I am strong, and some days I am weak. That statement was all that I needed to feel okay with my decision to indulge in the cupcake of my dreams. Another reason why I am not feeling guilty is because I made a conscious effort to continue my day as if I hadn't eaten the cupcake. I made sure to get in my 64 ounces of water and still worked out! In the past, I would have rationalized that cupcake as an excuse to eat even more. My thinking would have been that I had "blown" the day by going off target, and then I would binge. Yesterday, I beat my old way of thinking. By eating the cupcake, I impressed myself. I was impressed that I carried on, without the feeling of guilt pulling me down. I guess that I wasn't as weak as I thought! I think that it is safe to say that we have all had those moments where we speak what is on our mind without thinking about how it may affect those listening. There are times where we realize our mistakes almost immediately, and then other times where we might never realize the damage that was done. A co-worker of mine (I will refer to her as Tina, for my storys sake) made some remarks about her weight during lunch the other day. Tina was speaking about how she was trying to eat better, and how she was extremely dissatisfied with her current weight. Another co-worker of mine (I will refer to her as Kelly) asked how much Tina weighed right now. Tina told Kelly that she was now at 180 lbs. (Mind you, Tina's current weight is a weight that I would love to be at; I currently weigh 241 lbs.) Kelly went on to say how she couldn't believe that Tina weighed "that much" and that she "didn't look like she was that heavy". (Another side note: Kelly weighs about 130 lbs.) Tina laughed and thanked her before going on to tell her that she was in the middle of a weight rollercoaster. Tina admitted to Kelly that she was once "God awfully huge" and weighed in at a "whopping 220 lbs" when she was pregnant. Tina went on to explain how "disgustingly huge she was" and that she managed to get down to 140 pounds about two years after having her baby. The two co-workers knew that I was sitting right next to them, at what couldn't be mistaken for anything under, "a whopping 220 lbs". Yet, they went on discussing this topic with complete disregard. After being a part of such conversations in the past, I now know not to take these words personally. However, being human, it still hurt a bit to know that this is what my co-workers think; that 220 lbs is "God awfully huge" and "disgusting". I digress, I do not hold their opinion against them by any means. Why, you ask? Well, I feel like this is the standard that they have set for themselves. Most of us can agree that we are much harder on ourselves than others, right? The reason why I wanted to share this with you was because I know that we all have times where we need to think before we speak. If you are in a situation such as this in the future, I hope that you remember this post. I hope that you remember that when people are talking about their weight, they are referring to it according to the standard that they set for themselves. Try not to take it personally, and use these situations as a reflection of what you say in the presence of others about your own standards in life. Notice anything different? I have a new addition... to my blog! ......Ads!! You may wonder why I am excited about having ads on my blog. Apparently, bloggers have the opportunity to be paid if their readers click on ads that they find interesting to them. (Note to my readers: Please only click on ads that you are truly interested in.) I don't really expect to make much money (if any at all) but, I do see it as one more incentive for me to blog daily. Blogging daily has proven to give me more accountability while trying to adopt a healthier lifetstyle, so I'm all for more incentives for daily blogging! On another note, I am back home from my business trip. I haven't weighed myself since I have been back, but I'm not thinking that I will be losing any weight this week. Traveling for business while trying to eat healthy is tough! As of today, however, I still have 3 weeks before the new year. I feel like I still have enough time to get down to my goal of 235 lbs. by then! I can do it! ﻿I'm glad that I arrived back home yesterday, because it started snowing this morning. 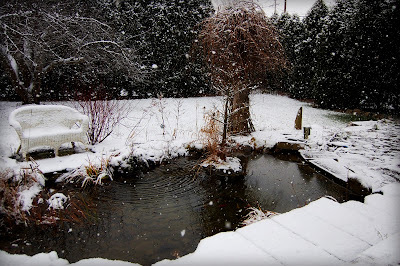 The photo above is of our pond. 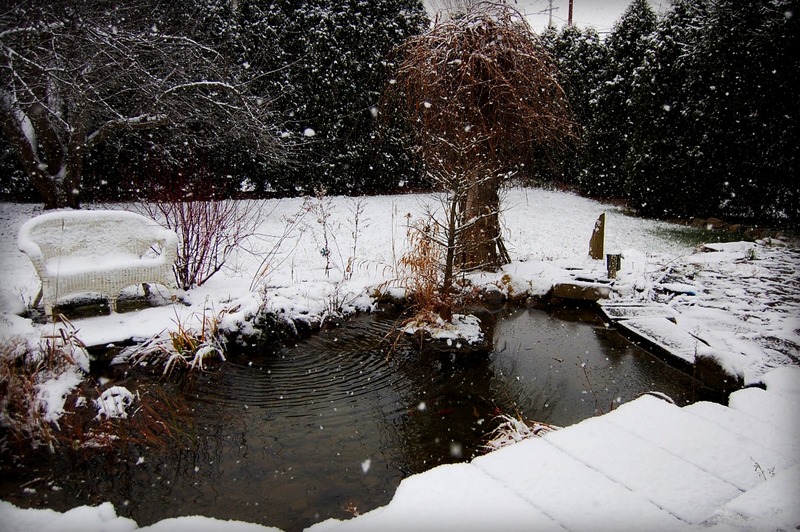 So far we just have a dusting of snow, but I'm thinking as the day goes on, that will change! 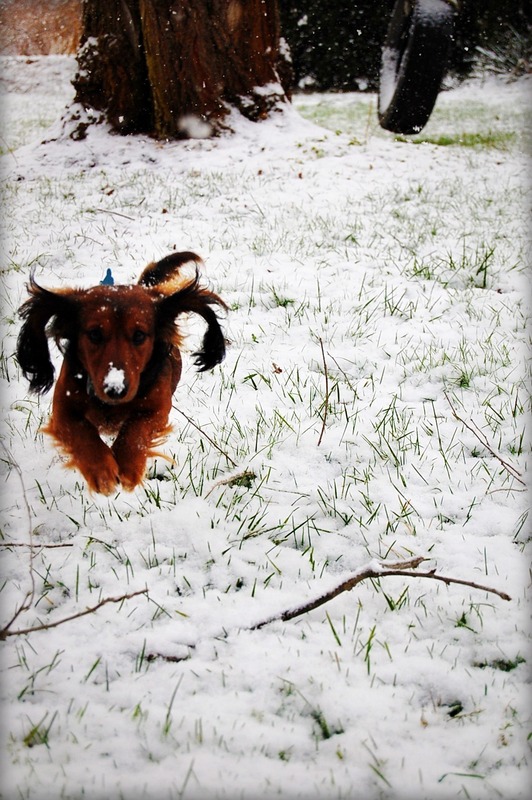 Our dog, Max, loves to frolic in the snow! He's a mini doxie so when the snow gets really high, as it usually does in our area, we have to shovel paths in the yard for him. Last year we had quite the maze going for him, and he loved running around it! Speaking of running, I am planning on doing some exercise today and tomorrow. I didn't accomplish my mini goal of going to the gym 3 times this week, even though there was a gym in the hotel. I brought my almost-sixteen-year-old sister with me on this business trip and instead of going to the gym, we walked laps around the mall. We actually found two malls in the area where I was staying for business, and we shopped walked at them both. Hey... they do say to engage in exercise that is fun for you, right? We had lots of fun! I have been having these "episodes" lately where I feel like I am having trouble breathing. My chest feels heavy, my heart starts racing, and I feel as if I have a lump in my throat. My co-worker thinks that it's anxiety, and I sure am hoping that's all it is. I use to get anxiety when I was in high school, but the episodes were a lot different than this, more obvious. My episode this afternoon was so severe that I felt as if I might pass out. These episodes seem to occur when I am relaxed, which is very annoying. I noticed them start the night that I started back on my copaxone. Speaking of my copaxone, I broke my little streak of taking my copaxone daily, last night. I was at my moms house when I got the reminder on my phone, and forgot by the time that I got home. I didn't remember until I was laying in bed (of course). I'm going to get right back at it tonight, though! Something else that I didn't get to is the gym. After the stressful afternoon that I had, and the anxiety attack, I just wanted to go home and relax. Oh, wait... did I say relax? Yeah, as soon as I got home to relax, another episode began. I just tried sitting back and taking deep breaths. It seemed to help! I leave for my business trip tomorrow morning, and I have a lot of packing to do tonight. I will definitely be using the gym in the hotel and WILL meet my goal of going to the gym 3 times this week! My nutrition range according to Sparkpeople has my calorie intake between 1200 and 1500 calories per day. I feel like that is pretty low, so I have been overeating on purpose. I try to eat within the 1600-1800 calorie range. I'm not planning on doing this forever, but right now it feels right. I didn't go to the gym tonight, however, I am planning on going tomorrow evening, right after work! I am going on a business trip this Wednesday and will not return home until Friday. There is a gym in the hotel and I plan on sticking with my goal of getting to the gym 3 times this week! Eating within *my* calorie range will be a challenge, being out of town for three days this week, but it's a challenge that I've overcome before, and it's a challenge that I can overcome again! Today was weigh-in day for me. Earlier this week, I weighed in at 245 lbs. This morning, I weighed in at 241.8 lbs! I'm working my way down! For breakfast, I made myself an "egg-white sandwhich" with one slice of bread, a slice of american cheese and catsup. I ate my breakfast later in the morning, and it was actually filling enough to last me until dinner. After breakfast, my husband and I did some yard work. We were blessed with a sunny and mild day outside. Strangely warm for December, in our area. We took full advantage of the wonderful weather and cleared out some flower beds. Once the sun decided to hide away behind some clouds mid afternoon, we decided to go grocery shopping. By the time dinner rolled around, we were both very hungry. I made tomato and mozzarella on ciabatta bread for dinner. We both had two sandwiches and I didn't feel guilty about that considering that I didn't have anything for lunch. Oh, I almost forgot! This morning, our friends (another couple) came over with a piece of cheesecake from the cheesecake factory. They had gone out last night and brought a piece back for us, since we had done the same for them sometime last year. The nearest cheesecake factory is 1 1/2 hours away. We usually go together, on a double date, so when we don't go with them, we like to bring them back a piece. It was nice to know they were thinking of us! I managed to only eat half of this. My husband and I shared! This week, I am hoping to get back out of the 240's once and for all! I am going to go to the gym at least 3 times this week and continue with my daily injections of copaxone. I can do it! Last night I made Kraft's recipe, Creamy Chicken and Pasta Bake. I made little changes to the recipe and it turned out great! I'm doing and feeling good! Grocery shopping and weigh in tomorrow. I'll report back, then! Today's office treat was donut holes. I had three of the chocolate for breakfast and one for a snack. I could have done better, and I could have done worse! Last night I went to the gym as planned! I walked on the treadmill for 20 minutes, at a fast enough pace to complete a mile. My legs were burning, and it felt really good! On my way home from the gym, I felt so refreshed! I was thinking clearer and I was finding joy in all of my thoughts! I was experiencing an endorphin high, and just from walking a 20 minute mile! I forgot how good that feels. It's definitely addicting. Tonight, I am going to be decorating the Christmas tree with my husband before he goes off to work. I've got some cleaning to do around the house; I have some girl friends coming over to bake and decorate cookies tomorrow evening. I wasn't planning on exercising tonight, but if I have time, I think that I will treat myself to some Wii Fit! I started my day with two clementines. I packed a good lunch and my gym clothes. December has begun, and I am going to make it a successful month! Along with my goal of losing 10 pounds and attending the gym 3 times a week this month, I am also going to incorporate the most important goal in my life to this months plan. I am making it a goal to restart my Copaxone injections to help lessen the progression of my M.S. These injections are daily, and I haven't been consistent since I began treatment in August. I haven't injected in over a month. This is a hard goal for me, but it's an important goal. I must take my daily injections. It's lunch time at work right now. I finished my soup and had a fun-size twix as a treat. That twix was actually my way of avoiding the cake that my coworker brought in today, "just because". I brought in a bag of carrots and a small salad for snacks for the remainder of the day. Whenever I am ready for a snack, I am going to walk right past that cake, grab my healthy snacks, and pat myself on the back!